Happy Thursday! 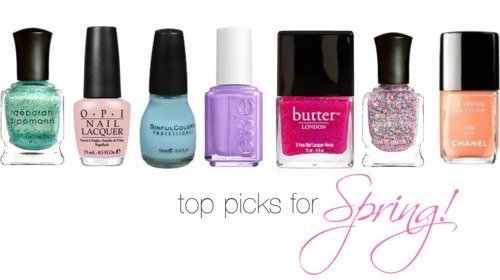 Today I want to share with you my top nail polish picks for Spring! As of right now, all I can do is look at my polish collection and dream... I got my stitches out tonight, but the wound is not 100% healed. I admit this terrifies me, but the doctor assured me it's fine and will just take time. For the time being I'll be giving my nails "some oxygen" as my sister Re says, a break from the paint. Yes, this depresses me horribly. Right now I have 10, well 15 new bottles of nail polish just staring at me begging to be used. But for now I'll just dream of better days. I have all of these except for Chanel June, which is on my lemmings list. Well, I'll be honest, I have a Wet n' Wild dupe, 'Cost Is No Issue' for Mermaid's Dream. And 'Candy Shop' is my birthday gift to myself. What colors are your top picks for Spring?